The Emergence of the Irish Dairy Industry: a Success Story or a False Hope? Ireland has become a booming location for dairy production and exportation over the past five years, and counting. The dairy industry has grown from the basic assortment of cheeses and milk to expansive specialized nutrition product lines that include infant formulas, weight-loss food products, and sports foods. 2014 was an incredibly positive sign for the Irish dairy industry, where exports increased by 30% to Asia, 19% to the Middle East, and 18% to North America. 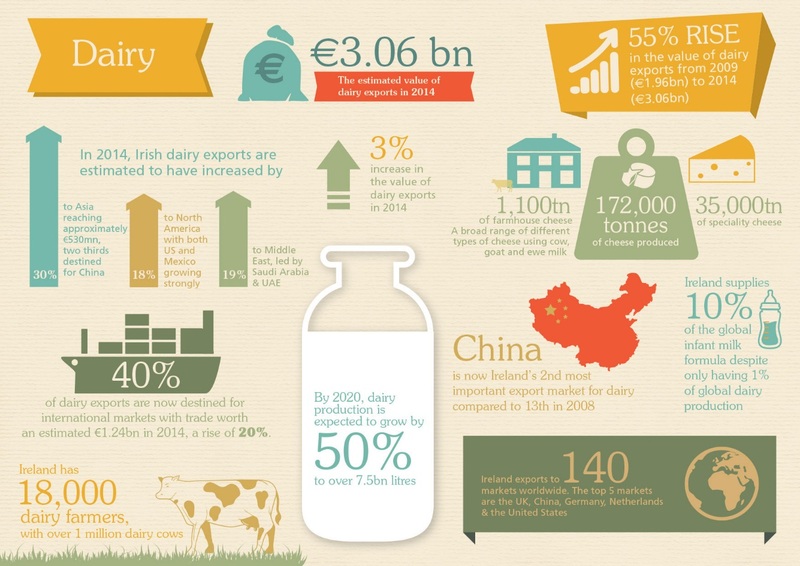 More specifically, China is of very large importance to the Irish dairy market. Being the largest dairy importer in the world, combined with a declining self-sufficiency, China is critical to the growth and sustained success of the dairy industry in Ireland. After a melamine catastrophe in China forced consumers to turn to foreign dairy producers, the infant formula market has skyrocketed, with Chinese imports in infant milk formula rising from 7,800 tons in 2013 to 18,500 tons in 2014. Domestically, Ireland is the third highest per capita consumer of milk in the world, with their consumption per annum reaching 130 liters per person. In the 18,500 dairy farms stretched out across Ireland, 5.5 billion liters of milk are produced each year. Ireland produces enough milk and dairy products to feed 52 million people per year! Most of the production from Irish dairy farms, however, does not go to individual consumers, but to domestic, regional, and international wholesalers. However, it is also important to recognize the growing importance of the organic market in the dairy industry. In 2008, 14 Irish organic milk producers formed to create the Irish Organic Milk Producers (IOMP). Together, this coalition produces the 3.8 million liters of the 6 million liters of organic milk products produced in Ireland today. While not the only organic farmers in Ireland, they represent a very important movement to encourage more farms and producer groups there is a future for development and partnerships in the organic market, and also represent the growing movement towards this sector from normal dairy products. While the dairy market has grown considerably, it is certainly not without its fair share of skeptics and critics. In an article by Catherine Cleary of the Irish Times (follow this link to read the article in its entirety: http://www.irishtimes.com/life-and-style/food-and-drink/milking-it-what-s-in-store-for-the-irish-dairy-industry-when-quotas-end-1.2125762), the author points out some of the possible flaws of this growing industry. Some of the following points have to do with the elimination of milk quotas around the world, which will allow limitless production and exports for this industry. For one, the pressure the government is putting on Irish dairy farms may be unreasonable. The government would like to increase Irish milk production 2.75 billion liters in the next five years, which means adding 300,000 dairy cows to farms; there are 1.1 million cows being milked in Ireland presently. This might mean more chemical fertilizers and more silage, which could possibly uproot the current landscape and economy in rural Ireland. Many of those observing the dairy industry also believe that the current conditions could lead to a “bubble” – where farmers would be left with bank loans and rapidly decreasing incomes, a comparable scenario to the future of college loans in America. Another concern that is entirely out of control of dairy producers is the ever changing weather patterns and climate. Climate change has brought unpredictable and often severe weather patterns to many regions of the world since the turn of the 21st century. The FAO/OCED Agricultural Outlook 2011-2020 Report states, “the most frequent and significant factor causing volatility is unpredictable weather conditions.” What may be worse is that by 2025, two-thirds of the world’s population will be living under water stress conditions. What that essentially means is that the surrounding water for certain people may not be able to meet the human and ecological demand for water, in regards to water quality, environmental flows, and accessibility. Only to worsen the problem, agriculture uses 70% of the world’s freshwater, so those in the dairy industry may only be feeding their own problem.